Surfing in Hawaii: The Ultimate Hawaii Vacation Adventure! Surfing in Hawaii: Ultimate Hawaii Vacation Adventure! To avoid repeating information written elsewhere, this discourse on surfing in Hawaii will serve as an introduction to the sport that I consider one of the most iconic activities to do in Hawaii. Local surfers: you need not read past this point. There’s nothing in here that you don’t already know. I’ve taught approximately a dozen different people to surf (with mixed results); and the one thing they all seem to have in common is a misplaced anxiety. They all worry that they won’t be able to stand up on the board when they catch a wave. You might be wondering the same; but that’s irrelevant until you overcome the first hurdle. If you’re new to surfing in Hawaii (or anywhere else for that matter), your first challenge is the paddle out to the lineup. If you can’t do that, you won’t have to worry about standing up on the board; and paddling tends to be a lot harder than most people expect. It uses muscles that many people don’t often exercise; and depending on the strength of the waves and currents, the difficulty can increase exponentially (especially for the inexperienced). Nevertheless – as evidenced by the sheer number of people out riding the waves – most people overcome this first hurdle with enough leftover energy to advance to phase two: catching the wave. To keep this simple, I’ll just suggest that you carefully watch the other surfers who seem to know what they’re doing and imitate them. Basically, you need to position yourself where the wave is breaking then start paddling toward shore in front of it so that you’ll already be in motion when the wave catches you (Newtonian physics). As soon as you feel the wave pushing you, attempt to stand up. Then repeat the process until your arms feel like they’re going to fall off from exhaustion. Congratulations, you’ve just gone surfing in Hawaii! The undisputed easiest place to learn how to surf in Hawaii is Waikiki Beach, and specifically the break directly in front of the Duke Kahanamoku statue, which is commonly called “Canoes” because of the outrigger canoes parked on the beach and/or giving visitors a thrill-ride out in the surf. The waves at this location are often an ideal size, shape and strength for beginning surfers. And conveniently, there are numerous board rental outfits parked right on the sand just a few meters from the water’s edge. As a result, it can get crowded quickly, but that doesn’t make this wave any less ideal or fun. Besides, the alternative locations are often equally crowded but less forgiving for beginners. Nevertheless, there is one other decent beginner’s break at White Plains beach in the old Barbers Point Naval Air Station area of Kapolei. 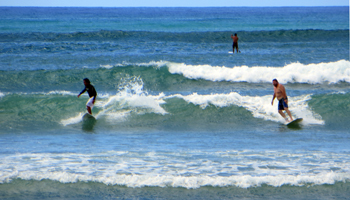 The water conditions are considerably less consistent than Waikiki, but they do rent boards and it’s a somewhat popular place for beginners to practice surfing in Hawaii. Because the waves are frequently not as ideal as elsewhere, the tradeoff tends to be smaller crowds in the water. I’ve surfed at both Waikiki and White Plains hundreds of times each, and I enjoy them both. But for my kids, who are just learning to surf, they definitely prefer Waikiki. Short surfboards (approximately 2 meters) may look coolest, but long boards (approximately 3 meters) are much more buoyant and stable – like the difference between a cruise ship and a dinghy. You may want to wear a rash-guard or T-shirt. Not only does this provide better sun protection, but it also helps prevent a painful “board-rash”, which many people get on their torsos from the movement of paddling. Use sunscreen. The water reflects sunlight, which gives you nearly twice the sun exposure of overhead sunlight alone. You’re a surfer, not a lobster (and even lobsters don’t turn red until they’re cooked). If you can’t see the surf by looking out your hotel window and you want to know the water conditions, you can call the Hawaii Surf Report at 808-596-SURF (7873). What’s normally referred to as the “Hawaiian scale” (and I’ve heard it’s also used in Australia and South Africa) measures waves ostensibly by the back of the wave from crest to average sea level. 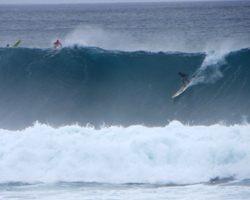 In practice, however, most Hawaii surfers make this size determination by estimating the height of the wave face and then cutting that in half. Thus, if a surfer who is almost two meters tall (approximately six feet) is riding a wave with a face equal to his head height, that wave is estimated to be one meter (approximately three feet) high in the back. 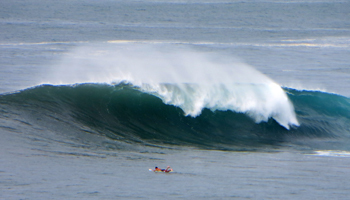 This is the method of measurement reported on the Hawaii Surf Report. Needless to say, that system might seem unnecessarily complicated to some. Since the wave face is the part of the wave visible from shore, another scale measures the height of the wave face from crest to trough and then reports that figure without any calculations. This is the method of measurement reported on most (if not all) of the television newscasts. Neither method is exclusively right or wrong. But if you’re new to surfing in Hawaii, it can make a big difference when measuring your ability against the reported wave heights. Use your eyes and then use your good judgment to determine what you can handle. 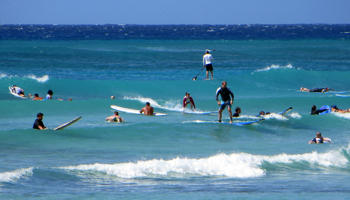 You can see people surfing in Hawaii at just about all of our magnificent Oahu beaches at any time you want. It will always be fun to watch whether you stay close to your hotel in Waikiki or you go scenic Hawaii sightseeing along some of our less-visited coastlines. And there are times when nearly every shore gets big, including the Waikiki and Honolulu areas. 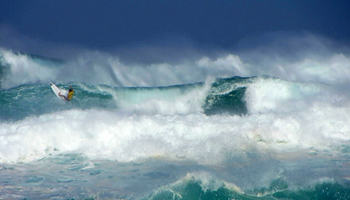 But for the truly monster waves of Hawaiian legend, you’ll need to drive out to North Shore Oahu in the wintertime. 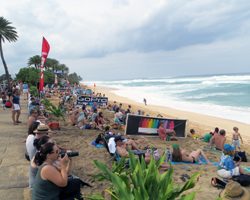 Depending on your timing, you might be able to watch professional surfing competitions such as one of the jewels in the Vans Triple Crown of Surfing or the Quicksilver in Memory of Eddie Aikau Big Wave Invitational. But even if the contests aren’t happening, from approximately October to March, our local wave riders will give you a show like no other at world famous Waimea Bay and countless other roadside breaks all along the Oahu North Shore. Disclaimer: If you’re new to surfing in Hawaii, you should never, ever, ever, ever consider trying to surf the North Shore in winter. Furthermore, every water activity has certain risks. 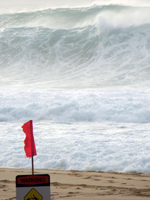 No matter how I describe the average conditions at these Hawaii beaches, stupidity and carelessness can still kill you. Use your brain and take responsibility for your own safety. Know the limits of your ability and stay within them. Watch your kids like a hawk. Heed posted warning signs. Never turn your back to the waves. Practice basic water safety at all times. It’s your Hawaii vacation. You should live to tell about it.